McIntosh Fine Bone China Set of 4 mugs, in an attractive gift box. Depicting the works of Casson - White Pine, A.Y. 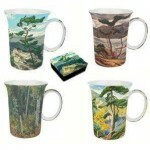 Jackson - Bent Pine, Johnston - Sunset in the Bush and Lismer - Bright Land. Each mug holds 325ml or 11oz.